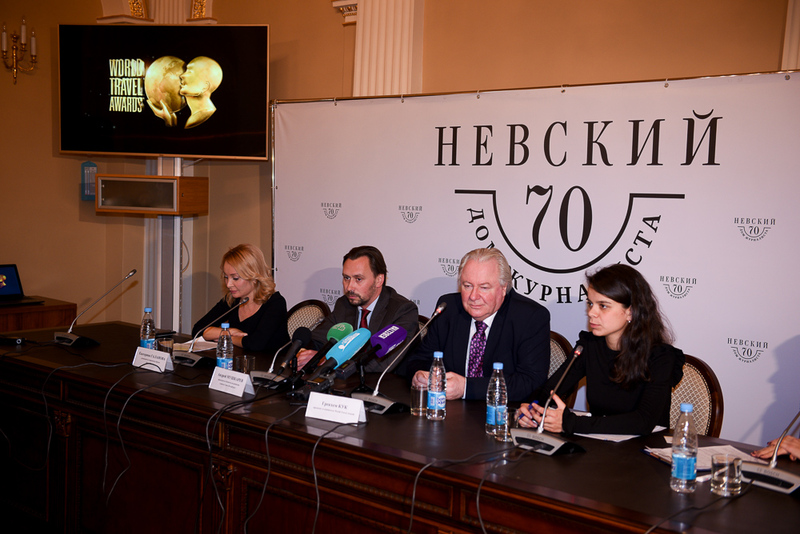 World Travel Awards president Graham Cooke has been welcomed to St. Petersburg ahead of the Europe Gala Ceremony 2017. The red carpet event will take place in the prestigious Marble Hall in the Russian Museum of Ethnography tomorrow evening, September 30th. In the build up to the event, Cooke, was welcomed to the city at an event hosted at Journalist House and attended by Andrey Mushkarev, chairman, Saint-Petersburg Committee for Tourism Development. Also in attendance were World Travel Awards vice presidents Chris Frost and Sion Rapson, as well as Ekaterina Galanova, general director of event partners Dance Open, who will present a showcase of Russian entertainment at the Europe Gala Ceremony. World Travel Awards president Cooke said: “I visited St. Petersburg more than 40 years ago, when the city was still called Leningrad. “It is amazing World Travel Awards has taken so long to return. “Nonetheless it is a privilege and honour to be here for this event this weekend. A UNESCO World Heritage site, St. Petersburg is home to 36 historical complexes and around 4,000 outstanding individual monuments, magnificent architectural ensembles, beautiful courtyards, splendid parks and unique museums. St. Petersburg Committee for Tourism Development chairman, Andrey Mushkarev, added: “We will be honoured to host the leading European tourism industry professionals in St. Petersburg. Earlier this year St. Petersburg hosted the final of the FIFA Confederations Cup, while next summer the city will welcome the FIFA World Cup. In recent news, the Russian capital of culture was also revealed as host the for UNWTO General Assembly 2019. Take a look at a selection of images from the event here, while a video of proceedings can be seen here.